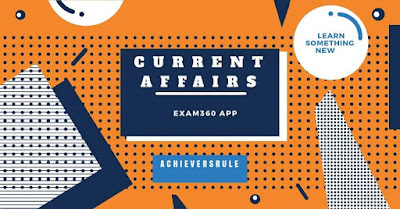 The Current Affairs Updates for 28th and 29th April 2018 includes all the news headlines of 28th April along with the Latest Headlines. Some of the important catchy news includes Tourism Minister inaugurates Indian Culinary Institute, Dalmia Bharat Limited has signed a (MoU) with the Tourism Ministry, Modi-Xi Wuhan Summit and more of such news. Each of the news have been explained in details mentioned in bullet points under various sections like National Appointment, National and International Affairs, Schemes, Agreements, Awards and Honors and other similar news. These are very important for the upcoming examinations of Bank like IBPS PO, IBPS CLERK, SSC CGL, SSC CHSL and other exams. Aspirants should go through the in details for better knowledge of the subject. World Intellectual Property Day is observed annually on 26 April. The event was established by the World Intellectual Property Organization (WIPO) in 2000 to "raise awareness of how patents, copyright, trademarks and designs impact on daily life" and "to celebrate creativity, and the contribution made by creators and innovators to the development of societies across the globe"
The Supreme Court collegium led by Chief Justice of India (CJI) Dipak Misra has unanimously recommended the name of senior advocate Indu Malhotra for appointment as a Supreme Court judge. With the approval of law ministry, she will become the first woman lawyer from India to be directly elected to the post of judge in the Supreme Court. Mike Pompeo was today sworn in as the secretary of state, shortly after the Senate confirmed the former CIA director’s nomination as America’s top diplomat at a crucial time when the US is involved in several high stakes negotiations around the world. Net loss stood at Rs 2,189 crore as against a profit of Rs 1,225 crore a year ago. For the entire fiscal FY18, profit plunged 92.5 per cent over the previous year. Fitch has kept India’s rating unchanged with a stable outlook, saying the rating balances a strong medium-term growth outlook and favourable external balances with weak fiscal finances and some lagging structural factors, including governance standards and a still-difficult, but improving, business environment. The second edition of Shirui Lily Festival has concluded today and the last day of the festival was attended by Works minister, Thongam Biswajit as chief guest while chairman of Tourism, Sapam Ranjan Singh was the president. The closing ceremony at TNL ground, Ukhrul was also attended by MLA of Tamei, Awangbow Newmai, MLA of Kshetrigao, N. Indrajit, MLA of Yaiskul, Thokchom Satyabrata Singh and MLA of Sekmai, Heikham Dingo Singh as guests of honour. This is the first time relics from Sarnath are being brought to Sri Lanka from India, and special arrangements have been made for this purpose. Niti Aayog Vice Chairman Rajiv Kumar expects India's economy to grow by at least 7.5 per cent in 2018-19 on the back of improvement in investment cycle and capacity utilisation. United Nations Secretary-General Antonio Guterres has appointed Christine Schraner Burgener, a Swiss diplomat with conflict resolution experience in Southeast Asia, as his special envoy for Myanmar. Since Indian diplomat Vijay Nambiar left the position of Secretary-General’s special adviser on Myanmar at the end of 2016 when Ban ki-Moon completed his term as UN head, the world body has not had a top-level pointsperson on Myanmar even as India’s neighbour spiralled into a deepening ethnic conflict spawning a refugee crisis. Light Combat Aircraft (LCA) Tejas, Indian Air Force's indigenous supersonic jet, is well on its way to becoming one of the most potent fighters in the four-plus generation combat aircraft class. The Defence Ministry on Friday approved military procurement worth Rs. 3,687 crore, which includes anti-tank guided missile NAG for the Army and long-range guns for the Navy. The proposals were cleared at a meeting of the Defence Acquisition Council (DAC) chaired by Defence Minister Nirmala Sitharaman. Former Prime Minister Manmohan Singh, released a book by former Planning Commission and Finance Commission member C H Hanumantha Rao. While launching Rao’s book, ‘My Journey from Marxism-Leninism to Nehruvian Socialism’, Singh called Rao ‘a most creative thinker, social activist, and distinguished economist. The Prime Minister of India Shri Narendra Modi launched the Van Dhan Scheme of Ministry of Tribal Affairs and TRIFED on 14th April, 2018 during the celebrations of Ambedkar Jayanti at Bijapur, Chattisgarh. To provide support to the health institutions in the national capital, the Delhi government will set up 'Rogi Kalyan Samitis' in each Assembly constituency and 'Jan Swasthaya Samitis' in state-run dispensaries, poly clinics and mohalla clinics. Dalmia Bharat Limited has signed a Memorandum of Understanding (MoU) with the Tourism Ministry to take up Red Fort and Gandikota Fort (Andhra Pradesh) under the ‘Adopt a Heritage’ project. India and China seem to have reached a broad strategic understanding on how to take forward ties, rocked by an unprecedented 73-day-long tense military standoff along their common borders last year, at the end of a rare informal summit between the top leaders of the two countries. The Indian Culinary Institute (ICI), Noida campus was inaugurated today by the Minister of State (Independent Charge) for Tourism and Minister of State for Electronics and Information Technology, Shri K. J. Alphons in presence of the Minister of State (Independent Charge) for Culture and Minister of State for Environment, Forest and Climate change, Dr. Mahesh Sharma for starting culinary courses. Indian men team bagged bronze while the women team clinched silver medals. Also, the mixed team claimed bronze in a nail- comprising Deepika Kumari, Bombayla Devi, and Laxmirani Majhi settled for Silver after getting defeated by Chinese Taipei trio of Tan Ya-Ting, Le Chien-Ying, Lin Shih-Chia in the finals. The Council of Scientific and Industrial Research (CSIR) has been awarded the National Intellectual Property Award, 2018 for being the top research and development organisation for patents and commercialisation. The CSIR has been ranked ninth amongst 1,207 government institutions, with an overall global ranking of 75 covering 5,250 institutions. Eminent Gujarati poet Sitanshu Yashaschandras poetry collection "Vakhar" has been chosen for the Saraswati Samman for 2017, the K K Birla Foundation has announced. Tennis player Anikta Raina, who has displayed good form this season both in the Fed Cup and the professional circuit, was on Saturday included in the government's Target Olympic Podium Scheme (TOPS).